Related Sites Looking for the college? Call 517-432-4700 to schedule an appointment with the Small Animal Clinic. Internal medicine is the medical specialty dealing with the prevention, diagnosis, and treatment of diseases of the internal body systems. Internists specialize in the management of patients that have disorders that are complicated to diagnose or to treat, or multi-system disease processes, or conditions that are not responding to treatment as expected. Our patients may be seriously ill and require hospitalization. Our team works closely with all other VMC services to provide our patients with the highest quality of care. We work especially closely with Diagnostic Imaging, Anesthesia, Emergency Services, Cardiology, Oncology, Ophthalmology, Dermatology, Interventional Radiology, and Soft Tissue Surgery. 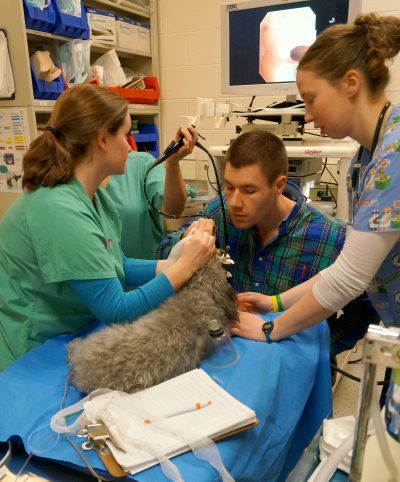 We are also supported by the MSU Veterinary Diagnostic Laboratory, which provides in-house diagnostics. Their pathologists and other specialists are available for consultation right here on campus. Endocrine disease, such as diabetes, thyroid disorders, adrenal gland disorders, etc.